Designed to fit many popular mini-DV cameras with matte boxes. 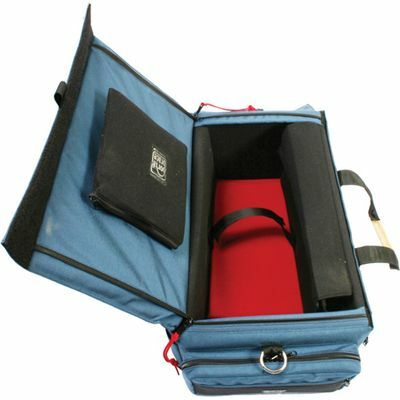 The DVO-3 Camera Case series (available in Signature Blue or Midnight Black with red accents) has extra room inside allowing you to keep many of the accessories attached while your camera is in the case. Inside the DVO-3?s 1000-denier Cordura® material and plastic-armored walls, there?s a camera tie-down strap and a soft stuff-pouch to keep the camera stable. There are 12 pockets to store plenty of accessories including a removable laptop pouch. Heavy-duty, suede leather shoulder strap included.